Angiosperms (flowering plants) may have originated more than 100 million years earlier than previously thought according to new research published in the academic journal “Frontiers in Plant Science”. A team of researchers from the University of Zurich (Switzerland) in collaboration with Geological Consulting & Services of Ober-Ramstadt, (Germany) have discovered microscopic evidence that suggests that flowering plants existed approximately 243 million years ago. Cores taken from rock strata dating from the Middle Triassic in northern Switzerland have revealed evidence of at least six types of angiosperm pollen, much of which bears a striking resemblance to fossil pollen associated with Lower Cretaceous deposits. It had been thought that the angiosperms evolved in the Early Cretaceous, it had even been suggested that the grazing habits of Ornithopod and Sauropod dinosaurs may have led to pressure on plant populations which resulted in the evolution of the flowering plants – the last of the great plant groups to evolve and one that has grown to encompass over 250,000 species today. Much of our modern world’s vegetation is characterised by flowering plants and most of our food crops are angiosperms, however, their origins and exactly when angiosperms first appeared has been the subject of a lot of debate. They probably evolved from derived pteridosperms (seed ferns) but there is a lack of clear, unambiguous fossil evidence to confirm this. Also, when they first evolved is not clear either, delicate plants do not fossilise well, but the tough pollen grains can be preserved and it is evidence of Triassic pollen grains that has pushed back the potential origins of flowering plants by 100 million years. New study changes our view of the Triassic landscape. Pollen grains are easily dispersed over wide areas due to their relatively small size and the high numbers produced. They can be found in various depositional environments (marine, coastal, and terrestrial). For this reason records of fossil pollen are most complete if compared to other plant organs such as seeds or leaves which are considerably more fragile and have a much lower fossilisation potential. Generally accepted first records of angiosperm pollen are mentioned from the early part of the Early Cretaceous (Valanginian—early Hauterivian), corresponding to an age range of approximately 139–133 million years ago (Early Cretaceous). However, within this interval, pollen fossils are extremely rare and poorly documented. Most microscopic studies of flora from Lower Cretaceous sediments lack any signs of fossil pollen at all. However, fossilised grains of pollen become more common in younger Cretaceous rocks and it was because of this data it had been thought that flowering plants evolved in the Early Cretaceous and then rapidly diversified over the next twenty million years or so to establish this group as the dominant terrestrial flora over much of the planet. Evidence of pollen grains from the Middle Triassic. 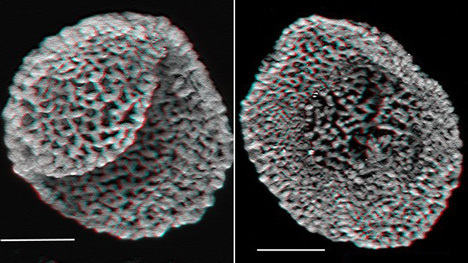 All angiosperms produce pollen, the male part in reproduction is encased in the tough, protective pollen grain and these tiny grains can be studied using microscopy and other techniques as they do tend to have a high preservation potential. Professor Peter Hochuli of the University of Zurich and his team used a technique known as confocal laser scanning microscopy to analyse rock samples dating from the Anisian epoch of the Middle Triassic. The research produced three-dimensional, highly detailed images of the outer, protective elements of fossilised pollen grains. Six distinct types of fossilised flowering plant-like pollen was identified, potentially changing the impression palaeontologists had of Triassic flora which formerly had been thought to consist of ferns, conifers, cycads, bennettitaleans, caytonialeans and other types of seed-plant. Intriguingly, the microscopic pollen fossils from the Mid Triassic strata looks very similar to the pollen fossils recovered from Lower Cretaceous deposits. The research team, which includes Dr. Susanne Feist-Burkhardt, suggest that these Triassic samples when compared to the oldest examples of Cretaceous pollen suggest an affinity to a basal group of angiosperms. Previous studies of Middle Triassic strata from the Barents Sea area, which Professor Hochuli worked on, may also have revealed microscopic pollen-like structures. This has led to scientists to conclude that flowering plants may have their origins either earlier than the Middle Triassic, perhaps basal forms existed in the Palaeozoic. What is surprising, is that as far as we at Everything Dinosaur are aware, no evidence of pollen has been found in studies of strata deposited in the Jurassic. There is now a hefty 100 million year gap between these Triassic aged findings and evidence of pollen being found in Lower Cretaceous aged rocks. Professor Hochuli has proposed an explanation for this anomaly. He suggests since scientists such as palaeobotanists did not expect to find pollen in Jurassic samples, they simply did not look for it. Were the Lystrosaurs at Home Amongst the Flowers? 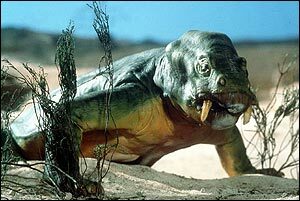 A prehistoric pig, a very successful synapsid reptile. The pollen grains make up a very small proportion of the overall flora recorded in the Middle Triassic strata, seed ferns, conifers and cycads were very much the dominant terrestrial plant life, but flowering plants had a foot hold which suggests that they may have originated even further back in time. The research team aim to study other European deposits but those that date from the Early Triassic and the Late Permian in a bid to discover evidence of the first types of flowering plants. 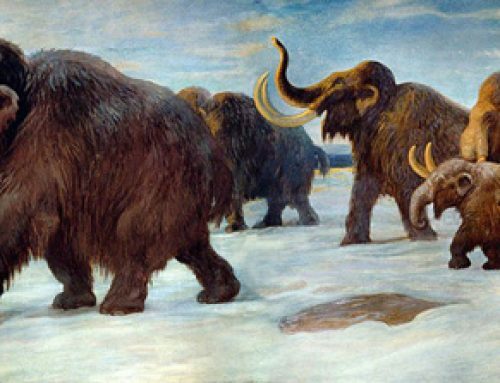 This throws up the interesting possibility that the Permian extinction event may have played a role in altering the mix of flora on our planet. The Permian period ended with a mass extinction event that wiped out seventy percent of terrestrial species, the void left in ecosystems could have been the spark required to promote the evolution of new types of plant such as the angiosperms.